When the first Ruger® 10/22® rifles appeared on the market back in 1964 one can only wonder if the manufacturer could possibly have predicted the incredible popularity of this rifle amongst shooters. Even now, after millions of them have been produced they are still probably the best selling .22 rimfire rifle today. Not only have they been shot exactly as they came from the factory there has been an incredible take up of these rifles by serious shooters, both for vermin control and for target shooting. In fact we have seen many 10/22’s® fitted with so many aftermarket parts that they may be scarcely recognised as a Ruger® 110/22® rifle were it not for the name on the receiver. Stunningly simple in its working mechanism which is renowned for its reliability it is not surprising that over the years this fine little rifle has spawned many similar rifles from other manufacturers. The UK handgun ban in 1997 was a crucial factor which encouraged us to start to offer customised Ruger® 10/22® rifles and it is no exaggeration to say that we owe our continued existence as a business entirely to our acceptance of the Ruger® 10/22® rifle. However after sellinghundreds of modified 10/22’s® we decided that the time had come to offer our own version of this iconic rifle and the Rimfire Magic brand first appeard back in 2008 and we are proud to confirm that we have now sold some 700 Rimfire Magic semi-auto rifles. Several changes to the specification of our receivers have been made over the years as we strived to overcome the one rather irritating and frustrating problems seen in almost all makes of semi-auto rimfire rifles, namely reliability! To be fair this problem is not so much down to the rifles themselves but rather to the ammunition as the .22 lr round operates at a fairly low pressure and tends to leave behind an amount of unfired powder together with products of combustion. After several tweaks to the dimensions of the Rimfire Magic receiver over the course of several production runs we finally reached what we believe to be the ultimate dimensions a few years ago and we are pleased to say that reliability has definitely been noticeably better ever since. There is however one major proviso when speaking of reliability and that concerns the need for cleanliness and lubrication! We happily give advice on the cleaning and lubrication of our rifles to each purchaser, confident in the knowledge that the shooter will reap maximum enjoyment from our rifles if they observe our recommendations! One of the major attractions of the Ruger® 10/22® is the availability of aftermarket parts which may be fitted to enhance the shooting pleasure of its owner, and whilst we offer a reasonable choice of stocks in particular we clearly cannot keep all types on the shelf so as well as providing complete rifles we do also offer a rifle without a stock where the purchaser already owns his or her choice of stock. Time has shown that there are several stocks which remain very popular with shooters and we always try to keep a reasonable stock of them (no pun intended here!) Whereas for many years we built our rifles to order we are now attempting to keep several of our most popular formats on the shelf for immediate delivery and many can be found below. Occasionally we take Rimfire Magic rifles in part exchange and these may be found on our Secondhand Firearms page. Naturally we still welcome specific rifle orders at any time and do our best to complete these orders within a week or so. The heart of our rifle is of course the receiver which is fully CNC machined from a solid block of quality aluminium by UK craftsmen. It features a picatinny base which is integral to the receiver, NOT attached with tiny screws! The receiver is then finished with black Cerakote for a hard, tough and eye catching surface. Previously we used a factory Ruger® 10/22® bolt but now we have upgraded this part and currently we use a Match Bolt manufactured by Power Custom (Grandmasters) in the US. This part has several advantages over the original factory one in that it is CNC machined from a block of 416 stainless steel and exquisitely finished to give an almost mirror like surface. The headspace dimension is rigorously controlled to the correct measurement and a titanium firing pin is held in place by a transverse pin across the bolt body to help resist lifting during cycling. The EDM produced extractor has a slight bevel to enhance feeding of the cartridge from the magazine. Whilst we employ a Ruger® 10/22® recoil guide rod and spring assembly as standard you are welcome to choose the option of a Power Custom oversize extended bolt handle assembly at a small extra charge if you wish. 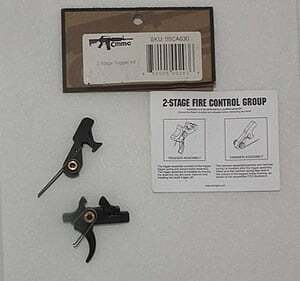 For the trigger unit we utilise a Ruger® 10/22® factory BX® trigger unit with a couple of upgrades. Firstly we use a custom reduced power trigger return spring manufactured in the UK but more important is the fitment of the CST kit produced by Mike Irwin in the US. 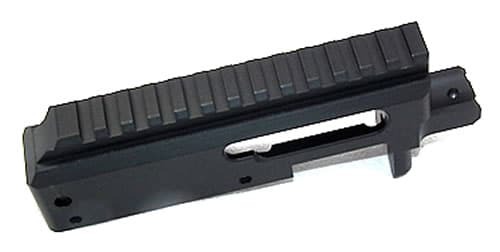 This clever device allows us to incorporate one of the features so often wished for with the 10/22® namely a last shot hold open whereby the bolt remains locked to the rear when the magazine is empty. The CST works with most factory magazines but will only work when used in conjunction with the Power Custom Match bolt. 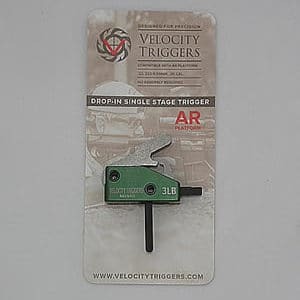 Our modified trigger unit gives a trigger pull of between 2.25lbs and 2.75lbs. The barrels we use are obtained from major US producers and over the years we have determined that they should all be capable of shooting one half inch groups at fifty yards and this has been confirmed by many shooters although naturally this will depend on the shooters individual skill and the type of ammunition used. One particular barrel has proved to be the most popular choice amongst shooters and that is the tensioned carbon fibre barrel produced by Volquartsen Firearms of Carroll, Iowa. This innovative barrel design consists of a thin rifled liner which is held under tension between two stainless steel end pieces by a tube of carbon fibre. This gives the accuracy historically found in heavy, varmint style barrels but without the weight of the latter. Volquartsen offer this barrel in 16″ length for the US market but they also produce, exclusively for us at Rimfire Magic, a 12.5″ version which of course meets the UK legal minimum length and this has been our best selling barrel for many years now. We are frequently asked if the accuracy form the shorter barrel is different to that achieved with the longer version. All we can tell you is that many customers have told us there is no difference so you can order the 12.5″ barrel with confidence. The shorter barrel is particularly sought after by vermin shooters who tend to use a sound moderator, as fitting a moderator to the shorter barrel results in an overall length only an inch or so longer then fitting a moderator to the 16″ barrel! You know it makes sense! Having started with the receiver and trigger and added the require barrel all that is necessary to complete your rifle is to select the stock. There is a plethora of stocks on the market for the Ruger® 10/22® which of course should also fit your Rimfire Magic barrelled action, but time has shown that the four stocks we offer from stock (if you will forgive the pun) have stood the test of time. We are prepared to offer any Rimfire Magic as a barrelled action without a stock if you already own a suitable one yourself and we will try to supply other alternative stocks if we are able to source them but we are confident that one of the stocks shown below will fit your needs. It’s easy to calculate the price for many Rimfire Magic rifles as we have adopted a straightforward menu pricing schedule. The price for the receiver unit complete with bolt, recoil guide rod assembly, recoil buffer and tuned trigger unit is £550 Then simply add the cost of your chosen barrel and then the stock and that’s the total for the complete rifle. We do offer a few options eg Power extended bolt handle assembly, a Power Custom competition magazine release, or a muzzle brake and any of these parts may be added for an extra £35 Occasionally we may be able to offer one or two other barrels or stocks for example and will always try to provide any other parts the customer may want. 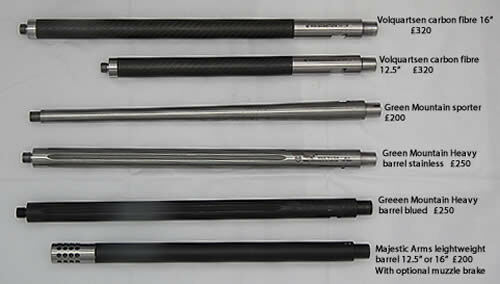 For those on a restricted budget we sometimes have used Match quality barrels available so please feel free to ask.